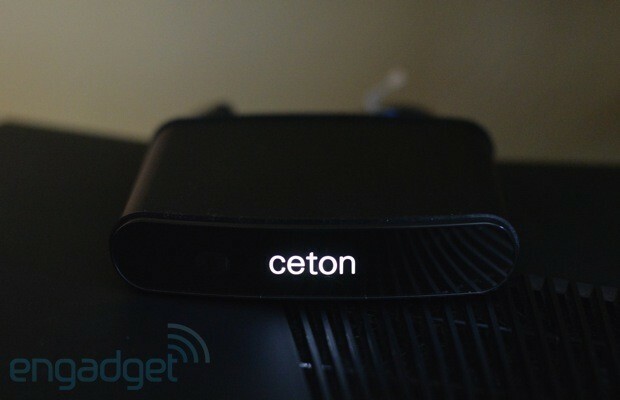 It's been over three years since Microsoft released a new version of Windows Media Center, and while some have declared the platform dead, the ecosystem lives on in companies like Ceton. Besides continuing to support Media Center, releasing new tuners and developing software, the company is now the first to introduce an extender in four years. The primary function of the $179 Ceton Echo extender is the same as those that came before it: to bring the full-featured Windows Media Center experience to more TVs in the house while centralizing all your media on a single PC. Until now our favorite extender has been the Xbox 360, but it retails for $20 more and the power supply alone is bigger than the entire Echo, so perhaps there's room for innovation here? We'll tackle all of that after the break. The Echo has the makings of the best Windows Media Center extender ever, but first Ceton needs to work out some bugs. How would you rate the Echo? What's missing is integrated WiFi, and we understand why. 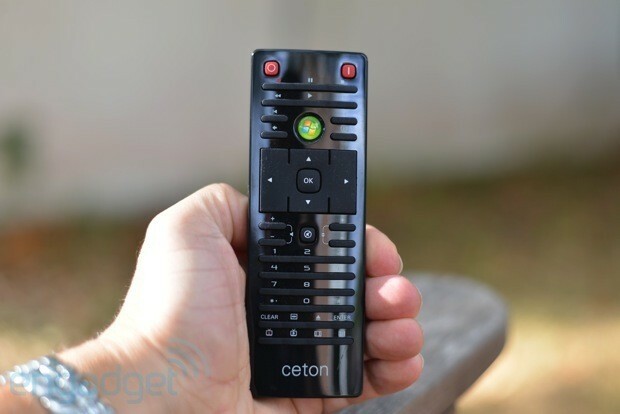 Unlike the prototypes we saw at CES 2012, the Ceton Echo is super small. Up front you'll only notice the company's very tasteful illuminated white logo. There's also a small window for the IR receiver, but you can't see it because it blends into the black front. Around back you have Gigabit Ethernet, HDMI, Toslink, USB and a mini-USB port for power. The included network and HDMI cables are appreciated, too. Speaking of power, it isn't an internal power supply like in, say, the Apple TV. Instead the power is supplied via a standard USB cable and the plug looks like one that might come with a mobile phone. We were able to plug the USB cord directly into a TV and power the device, even though the company doesn't officially support this -- presumably because not all TVs supply adequate amperage via USB. What's missing is integrated WiFi, and we can understand why. Many older Media Center extenders did feature WiFi, but endless support forum threads show that broadcast TV via WiFi is a recipe for pain and suffering. It's true that modern WiFi networks have more than enough bandwidth to deliver the maximum 19.3 Mbps that broadcast TV has to offer; the reality, though, is that WiFi is susceptible to interference, and the last thing you want is your neighbor's cordless phone getting in the way of your TV time. If you just have to try it for yourself, you can always get yourself a bridge, but don't say we didn't warn you. The little box measures just 0.8 inch tall, 4.3 inches wide and 3.9 inches long and feels very slick with its black aluminum casing and plastic caps. It never used more than four watts of power in our testing (one watt when off) which probably explains why it runs relatively cool. Don't take that to mean actually cool, though. We're also very impressed with the build quality. Then again, we have low expectations after handling many media streamers over the years. One thing we do wish, however, is that there was a way to mount the little guy. There are no holes in the back; nothing. As soon as you hold it in your hand, you can't help but dream up ways of affixing it behind every wall-mounted TV in your house. Perhaps Ceton will follow up with an accessory mount, or we can just grab some cable ties and double-stick tape. Let's just get this out of the way right now: we hate the remote. In fact, the only thing we like about it is that we don't have to use it. That's because the Echo is compatible with a plethora of Windows Media Center remotes already available; this reviewer actually has a few of his own to choose from. But just in case you're planning on using the remote, this is why you should reconsider: the buttons are too small, don't have letters on the number keys for triple-press text entry and are hard to find without looking down. You can't program the volume or the power buttons to control your TV, but worse -- and unlike almost every remote ever made -- there are two power buttons: a discrete on and a discrete off. The green button is even too small for our liking and the remote doesn't use standard batteries (can't say we've ever seen a remote that uses coin batteries). And then there is the cardinal sin for remotes, there are buttons on it that don't do anything, like the Eject and DVD buttons. From a software perspective, a Media Center extender does only one thing: deliver the Windows Media Center experience to a TV without a PC attached to it. The Xbox 360 has always been unique in that it replicates the animated transitions and transparent menus truer than any other extender can ever do it, thanks to Microsoft's third-party extender specification. That being said, a lot of that responsiveness has been lost along the way through all the dashboard updates that have been pushed out over the years. So, while the Xbox 360 experience still has a few unique elements that can't be matched by the brand-new Echo -- the animated transitions are still something almost no other set-top box can do -- we found the overall experience more enjoyable than what we've become accustomed to recently. For example, the Xbox is known not to respond to the press of the remote, and tends to queue up commands. The Echo, on the other hand, kept up with no hint of UI lag. Fast forward, rewind and skip all work as quickly as you'd expect from using a real HTPC running Media Center, as did changing the channel. We found the overall experience more enjoyable than what we've become accustomed to recently. One point of differentiation from all the other extenders we've tried is that the Echo allows you to configure its various options via a Media Center plug-in. While the Xbox 360 requires a quick trip to the dashboard to edit things like resolution and audio output, the Echo is easily configured without a gaming controller, thanks to a user interface that has the same look and feel as the rest of Media Center. This is achieved by installing a plug-in on the host Media Center PC and then navigating to the Extras menu via Media Center on the Echo. There are eight main menus to choose from with settings like output video resolution and audio via HDMI or Toslink, but there are also some nice additions like the ability to skip startup animations and sounds. 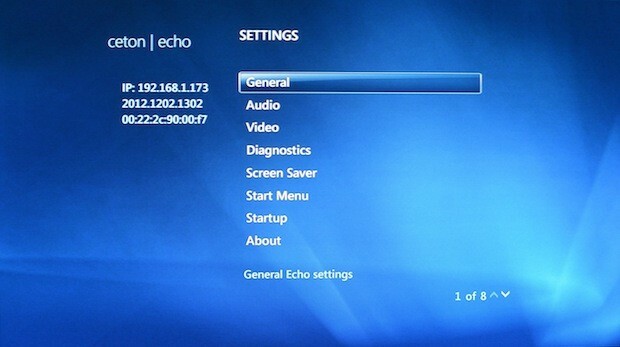 Other options are very handy, like the option to have the Echo take you directly to Recorded TV when it is turned on -- rather than the main menu, which is the default in Media Center. There are a few cosmetic options as well, including the ability to slim down your main menu by removing items you don't use -- sounds trivial, but this is something, believe it or not, that isn't easily done in Media Center. We saved the bad news for last: unfortunately the release version of Ceton Echo has a bug that seriously limits its usefulness -- beta builds include a fix. The problem is especially apparent with 1080i playback. It might not seem like a big deal with all the 1080p TVs these days, but 1080i is actually still the most prevalent broadcast format and the way it's currently rendered by the Echo makes it unwatchable. The most obvious problem is the frame rate which results in a nauseating mess of flicker and judder whenever there is any moving object; as in sports or news tickers. But that isn't all, as the black levels are noticeably grey and any compression artifacts appear amplified. Ceton has acknowledged the problems on its site and even has a fix currently in beta. The statement stops short of actually promising a date, though. This is very disappointing because this bug effectively makes everything we like about the Echo a moot point, as without rock solid 1080i playback, we couldn't recommend this device to anyone. There are a few other less notable issues with the Echo, but no others that would get in the way of us enjoying the Echo. All that said, after having a chance to try out the beta build that fixes this, it gives us confidence that 1080i can look as good once it is pushed to everyone. If you don't share our confidence, Ceton has also extended the return policy to 90 days and the warranty out to two years. The almost year-long wait for the Echo has left us disappointed and also, surprised. 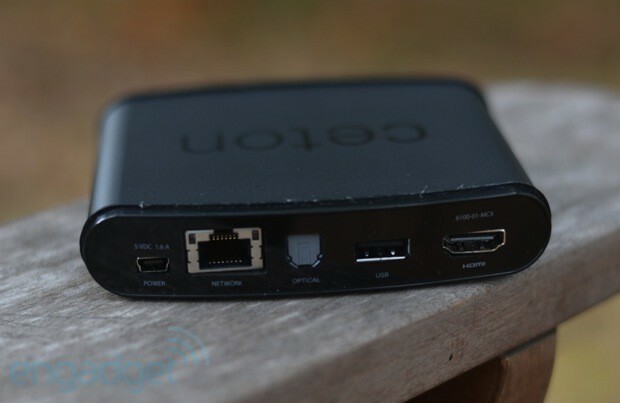 We're surprised that Ceton didn't hold the product until a bug that prevented perfect 1080i playback was fixed. That being said, it otherwise works well and we trust that a fix is forthcoming and already in beta builds. Some will scoff at the price because the Xbox 360 offers more features for the same price -- or less, if you can find a good deal. If you enjoy gaming and don't mind spending the money on Xbox Live Gold to access the Xbox's other video services, then it's clear the Echo isn't for you. On the other hand, if you really just want to ditch your cable box and have the same great Windows Media Center experience in the bedroom that you have in the living room, then the Echo is a better solution -- once the beta that fixes 1080i playback is released, of course. There are also lots of other lower-priced media streamers out there with seemingly more content, but there's still one big feature that sets the Echo apart: it can play live TV, including premium content like HBO. So while services like Netflix, Amazon and Vudu are very compelling, there's a reason why cable is still the most popular source of content in the US. If the Apple TV and Roku are the cord-cutter's or cord-never's dream, the Echo is for everyone else. It's unlike the rest of the media streamers out there in that it does have what it takes to live on input one.